(Update) We're giving away 500 keys to Paladins' closed beta! Update: The keys are being sent out now! If you don't get an email in the next couple of hours, you haven't won a key. Better luck next time! Original: We're giving away 500 keys for Paladins' closed beta test, and you can enter to win one! 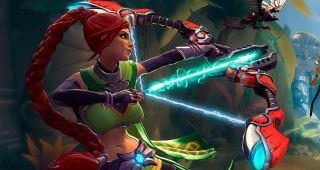 Paladins is a free-to-play FPS with a deck-building mechanic from Hi-Rez Studios, developers of Smite. We played it briefly at TwitchCon back in September and thought it was good fun. Today marks the beginning of Paladins' closed beta test, and we've got 500 keys up for grabs. To enter for a chance to win a key, enter your email in the widget below. Simple as that! We'll be picking 500 random winners and sending keys out to the email address you've entered (so make sure it's correct) on Wednesday, November 18th at 12 pm ET. Additionally, the Paladins servers will only be up for 12 hour windows for the first few days of the closed beta. Initially Paladins will be playable from 12 pm ET to 12 am ET. Hi-Rez will update beta participants on when that changes.